The lateral ventricles are the two largest cavities of the ventricular system of the human brain and contain cerebrospinal fluid (CSF). Each cerebral hemisphere contains a lateral ventricle, known as the left or right ventricle, respectively. Scheme showing relations of the ventricles to the surface of the brain; oriented facing left. Drawing of a cast of the ventricular cavities, viewed from the side; oriented facing right. Each lateral ventricle resembles a C-shaped structure that begins at an inferior horn in the temporal lobe, travels through a body in the parietal lobe and frontal lobe, and ultimately terminates at the interventricular foramina where each lateral ventricle connects to the single, central third ventricle. Along the path, a posterior horn extends backward into the occipital lobe, and an anterior horn extends farther into the frontal lobe. Each lateral ventricle takes the form of an elongated curve, with an additional anterior-facing continuation emerging inferiorly from a point near the posterior end of the curve; the junction is known as the trigone of the lateral ventricle. The centre of the superior curve is referred to as the body, while the three remaining portions are known as horns (cornus in Latin); they are usually referred to by their position relative to the body (anterior, posterior, or inferior), or sometimes by the lobe of the cerebral cortex into which they extend. Though somewhat flat, the lateral ventricles have a vaguely triangular cross-section. Ependyma, which are epithelial cells, cover the inside of the lateral ventricles. The anterior horn of lateral ventricle or frontal horn, is the portion which connects to the 3rd ventricle, via the interventricular foramen. This portion of the lateral ventricle impinges on the frontal lobe, passing anteriorly and laterally, with slight inclination inferiorly. It is separated from the anterior horn of the other lateral ventricle by a thin neural sheet - septum pellucidum, which thus forms its medial boundary. The boundary facing exterior to the ventricle curvature is formed by the corpus callosum - the floor at the limit of the ventricle is the upper surface of the rostrum (the reflected portion of the corpus callosum), while nearer the body of the ventricle, the roof consists of the posterior surface of the genu. The remaining boundary - that facing interior to the ventricle curvature - comprises the posterior edge of the caudate nucleus. The body of the lateral ventricle is the central portion, between the anterior horn and the trigone. Its roof continues to be bound by the corpus callosum - here known as the tapetum (carpet) - and remains separated medially from the other lateral ventricle by the septum pellucidum. The tsil (cauda) of the caudate nucleus forms the upper portion of the lateral edge, but it is not large enough to cover the whole boundary. Immediately below the tail of the caudate nucleus, the next portion of the lateral edge is formed by the comparatively narrow stria terminalis, which sits upon the Superior thalamostriate vein. The main part of the Fornix forms the next narrow portion of the lateral boundary, which is completed medially by a choroid plexus, which serves both ventricles. The posterior horn of lateral ventricle, or occipital horn, impinges into the occipital lobe in a posterior direction, initially laterally but subsequently curving medially and lilting inferiorly on the lateral side. The tapetum of the Corpus Callosum continues to form the roof, which due to the lilt is also the lateral edge. However, the posterior and anterior ends of the Corpus Callosum are characterised by tighter bundling, known as forceps (due to the resulting shape), to curve around the central sulci; the edge of these forceps form the upper part of the medial side of the posterior horn. The remainder of the medial edge of the ventricle is directly in contact with white matter of the cortex of the occipital lobe. The inferior horn of lateral ventricle or temporal horn, is the largest of the horns. It impinges on the temporal lobe in a lateral and anterior direction, initially inferiorly, until it comes within 2.5 cm. of the lobe's apex; its direction is fairly well indicated on the brain surface by the superior temporal sulcus. The horn lilts inferiorly towards its lateral edge. As a continuation of the interior side of the ventricular curve, the floor of the body of the ventricle becomes the roof of the inferior horn, hence the tail of the Caudate Nucleus forms the lateral edge of the inferior horn's roof, until, at the extremity of the ventricle, the Caudate Nucleus becomes the Amygdala. The stria terminalis forms the remainder of the roof, which is much narrower than at the body - the choroid plexus moves to the medial wall. The tapetum for the temporal lobe comprises the lateral boundary of the inferior horn, on its way to join the main tapetum above the body of the ventricle (passing over the Caudate Nucleus as it does so). The majority of the inferior horn's floor is formed by the fimbria hippocampi (from which the fornix emerges), and then, more anteriorly, by the hippocampus itself. As with the posterior horn, the remainder of the boundary - in this case the lateral side of the floor - is directly in contact with the white matter of the surrounding lobe. 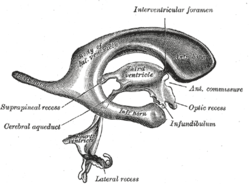 Between the inferior horn and the main body of the ventricle is the Putamen, which emerges from the head of the Caudate Nucleus, and sits above the tapetum; a small number of further connections passing through the occipital tapetum to join the Putamen to portions of the Caudate Nucleus tail adjoining the anterior horn. Below the Putamen sits the globus pallidus, with which it connects. These structures bounding the lateral ventricles form a frame curving around the thalamus, which itself constitutes the main structure bounding the third ventricle. Indeed, were it not for the choroid plexus, a cleft-like opening would be all that lay between the lateral ventricle and the thalamus; this cleft constitutes the lower part of the choroid fissure. The thalamus primarily communicates with the structures bounding the lateral ventricles via the globus pallidus, and the anterior extremities of the fornix (the mamillary bodies). The lateral ventricles, similarly to other parts of the ventricular system of the brain, develop from the central canal of the neural tube. Specifically, the lateral ventricles originate from the portion of the tube that is present in the developing prosencephalon, and subsequently in the developing telencephalon. During the first three months of prenatal development, the central canal expands into lateral, third, and fourth ventricles, connected by thinner channels. In the lateral ventricles, specialized areas – choroid plexuses – appear, which produce cerebrospinal fluid. If its production is bigger than reabsorption or its circulation is blocked – the enlargement of the ventricles may appear and cause a hydrocephalus. The neural canal that does not expand and remains the same at the level of the midbrain superior to the fourth ventricle forms the cerebral aqueduct. The fourth ventricle narrows at the obex (in the caudal medulla), to become the central canal of the spinal cord. Fetal lateral ventricles may be diagnosed using linear or planar measurements. The volume of the lateral ventricles are known to increase with age. They are also enlarged in a number of neurological conditions and are on average larger in patients with schizophrenia, bipolar disorder, major depressive disorder and Alzheimer's disease. Asymmetry in the size of the lateral ventricles is found in about 5–12% of the population. It has been associated with handedness, where right-handed people have been found to have a larger right lateral ventricle and a longer left occipital horn, whereas left-handed people have been found to have longer right occipital horns. A severe asymmetry, or an asymmetry with midline shift or diffuse enlargement, may indicate brain injury early in life, particularly in cases of a longer right occipital horn. Position of lateral ventricles (shown in red). Wikimedia Commons has media related to Lateral ventricles. ^ Crossman, A R (2005). Neuroanatomy. Elsevier. p. 32. ISBN 978-0-443-10036-9. ^ Le, Tao; Bhushan, Vikas; Vasan, Neil (2010). First Aid for the USMLE Step 1: 2010 20th Anniversary Edition. USA: The McGraw-Hill Companies, Inc. p. 126. ISBN 978-0-07-163340-6. ^ Carlson, Bruce M. (1999). Human Embryology & Developmental Biology. Mosby. pp. 237–238. ISBN 0-8151-1458-3. ^ Glonek, M; Kedzia, A; Derkowski, W (2003). "Planar measurements of foetal lateral ventricles". Folia morphologica. 62 (3): 263–5. PMID 14507062. ^ Wright IC, Rabe-Hesketh S, Woodruff PW, David AS, Murray RM, Bullmore ET (January 2000). "Meta-analysis of regional brain volumes in schizophrenia". Am J Psychiatry. 157 (1): 16–25. doi:10.1176/ajp.157.1.16. PMID 10618008. ^ Kempton, M.J., Geddes, J.R, Ettinger, U. et al. (2008). "Meta-analysis, Database, and Meta-regression of 98 Structural Imaging Studies in Bipolar Disorder," Archives of General Psychiatry, 65:1017–1032 see also MRI database at www.bipolardatabase.org. ^ Nestor, S; Rupsingh, R; Borrie, M; Smith, M; Accomazzi, V; Wells, J; Fogarty, J; Bartha, R. "Ventricular Enlargement as a Surrogate Marker of Alzheimer Disease Progression Validated Using ADNI". Brain. 131 (9): 2443–2454. doi:10.1093/brain/awn146. PMC 2724905. ^ a b Mortazavi, M. M.; Adeeb, N.; Griessenauer, C. J.; Sheikh, H.; Shahidi, S.; Tubbs, R. I.; Tubbs, R. S. (2013). "The ventricular system of the brain: a comprehensive review of its history, anatomy, histology, embryology, and surgical considerations". Child's Nervous System. 30 (1): 19–35. doi:10.1007/s00381-013-2321-3. ISSN 0256-7040.